Pinball Pimp does all things pinball. 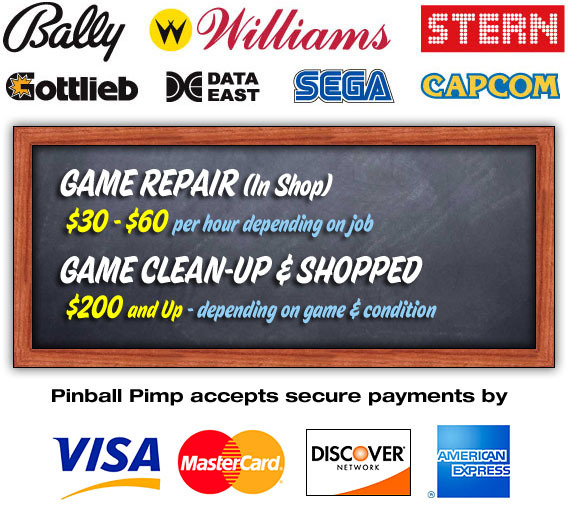 Service, Restoration & Repair on all pinball machines by Bally – Williams – Stern – Gottlieb – Data East – SEGA – Capcom. We also work on Solid State and Electro-Mechanical (EMs) machines as well. Bally & Williams Precision Cut CABINET STENCIL KITS are available for many of the classic machines you see in my Photo Gallery. You can ORDER them at my other site PINBALL PIMP PREMIUM CABINET STENCILS. Each machine receives approximately 50-100 hours of restoration work before it heads out the door. Here is some of what we do! • All ramps are removed, cleaned & flame polished making them look new!